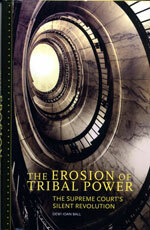 THE EROSION OF TRIBAL POWER: THE SUPREME COURT’S SILENT REVOLUTION, by Dewi Ioan Ball. University of Oklahoma Press, 2016. 400pp. Hardcover $39.95. ISBN: 978-0-8061-5565-4. The analysis of Supreme Court influence over indigenous sovereignty by Welsh historian Dewi Ioan Ball offers a new perspective into indigenous case history. Ball argues that the Supreme Court “precipitated the erosion of the Indian sovereignty doctrine” (p. 5) by gradually replacing the doctrine with an “integrationist” ideological trend that increasingly allowed state law onto reservations and ended tribal territorial sovereignty over non-Indians in criminal, civil, and taxation areas. Ball asserts that the “integrationist trend” began in 1959 when the Court starts to conceptualize conflicts between tribes and states not as tribes versus states but rather as tribes versus the federal government, encompassing indigenous interests against states (p. 32). This ideological shift is apparent in WILLIAMS V. LEE (1959) which created the infringement test. This test was later interpreted to imply that state law exists on reservations unless it infringes upon tribal governance, narrowly defined (p. 41). While cases between 1959 and 1973 reveal ambivalent court discussions, consistently debating between the sovereignty doctrine and “integrationist” interpretation that tribal powers rest at the hands of Congress, Ball notes that WILLIAMS V. LEE marks the “foundation” of the upcoming “silent revolution” (p. 6). Namely, he argues that the infringement test created the legal space for future Courts — specifically the Supreme Court in the 1970s — to initiate the “silent revolution.” This revolution, occurring between 1973-2001, is marked by the Court’s increasing reliance upon the assumption that tribal authority over non-Indians existed only when Congress legislated it. This framework led the Court to increasingly rule in favor of state powers rather than tribal authority and marked the end of Court reliance of the tribal sovereignty doctrine to determine cases. By 1989 in taxation cases and 2001 in civil cases, the Court “cleverly” generated a “new legal history” that eradicated tribal sovereignty over non-Indians on Indian lands (p. 110). This argument is neatly laid out over the first half of the book. Ball’s thick descriptions are lucid and enlightening as he traces the evolution of the Court and individual justices as they wrestle with the alternative legal interpretations and disparate precedents. The level of detail and nuance offered is made possible by Ball’s impressive archival research on justice notes and correspondences from 1959-2001 in addition to a handful of cases decided between 2001 and 2015. Ball further includes oral arguments and private papers of seven justices: Harry A. Blackmun, Thurgood Marshall, William J. Brennan, William O. Douglas, Hugo Lafayette Black, Lewis Powell, and Chief Justice Earl Warren. These sources enable readers follow the ideological battles across the justices and trace their ideologies across cases. These primary sources further highlight the messiness of the deliberations along with individual justices’ desires and perspectives. For example, some justices held that the sovereignty doctrine was “not strong enough to oust state law” from reservations while congressional intent was deemed more effective to prevent state intrusion. For these justices, reliance on the integrationist approach was necessary to ensure tribal authority. In contrast, other justices found tribal sovereignty irrelevant (for example, [*53] see pp. 86-88). In addition, the texts provide insights into the justices’ preference for consistency, their desire to determine cases narrowly so as to avoid broad language that would be inappropriately applied in future cases, and the impact of case facts that would lead particular justices to vote with a majority that seemingly contradicted his/her legal and ideological preference. Ball excels at presenting a glimpse into judicial debates and decision making at the individual level. The second half of the book discusses the impact of this revolution on Indigenous Peoples. Ball’s discussion on how the Court’s jurisprudence impacted indigenous litigation strategies and attempts to avoid having cases heard by the Supreme Court is particularly notable. Ball is one of the few authors to explicitly discuss this crucial nexus in this context, so this chapter was unique and enlightening. Ball focuses primarily on Senate Bill 578 and the responses to its demise, such as the Tribal Law and Order Act of 2010 and Violence Against Women Reauthorization Act of 2013. The in-depth focus allows the reader to understand how complicated and difficult indigenous rights advocacy is, as well as places the Court within the larger political context. The final chapters similarly reflect on how court jurisprudence has affected Indigenous Peoples’ ability to generate revenue, protect and provide for their members, and secure their cultural identities. This book excels at offering an in-depth look at judicial deliberations that is accessible for general, lay audiences. Ball makes no assumptions about the reader’s understanding of indigenous law or courts and thus avoids jargon, explains judicial processes, and makes explicit the implications of each argument. Hence, this book is an accessible introduction to indigenous law in the American Supreme Court. Such a book could be easily used in academic settings at the undergraduate or graduate levels. Yet the book simultaneously promises to be an intellectually stimulating read for non-introductory readers as well. I suspect that public law and political science readers will fall into two camps. The first camp will be those decrying the lack of causal analyses in the book. For all the nuanced descriptions on judicial deliberations, the arguments falter on their causal accounts of Court intent and behavior. Ball provides ample evidence of the observed transitions of the use of the sovereignty doctrine and its gradual replacement. Yet, throughout the book, Ball also offers speculative accounts to possible influences on Court decision making, such as the Red Power movement (p. 59), advocacy strategies (p. 49), law clerk memorandums (p. 108), and individual justices sympathetic to indigenous causes (p. 39). None of these speculations include evidence or analysis. Similarly, in the second half of the book, Ball focuses on how Court jurisprudence caused decreased tribal revenue generation capacity (p. 184), increased crime rates perpetrated by non-Indians (p. 195), and increased nation building within tribes (p. 203). No causal analyses are undertaken, though Ball offers anecdotal evidence and secondary source materials that make these arguments plausible. For example, in terms of increased non-Indian crime on reservations, Ball cites Bureau of Justice Statistics for the 1990s-2000s, which clearly establishes the severity and prevalence of crime experienced on reservations. Yet, his argument is that the Court’s decision in OLIPHANT V. SUQUAMISH INDIAN TRIBE (1978) specifically caused these effects. This disparity between causal arguments and lack of any sort of causal analysis is likely to frustrate some readers. However, the second camp of readers is likely to view these shortcomings as part and parcel to the exploratory nature of this area of research. Few political science and public law scholars have focused on indigenous law and the Court’s role in this area. Combined with severely limited data, virtually no quantitative analyses have been [*54] undertaken in relation to court behavior and indigenous law. Hence, readers could view these arguments as invitations to evaluate these causal arguments more directly. In this light, the book provides ample fodder for future research. For instance, Ball often focuses on the writings of Warren and Rehnquist, which could lead one to ask: to what extent did the Chief Justice influence court decisions and legal frameworks of these cases? The descriptions also allow for implications examining the effect of bargaining, dissents, opinion authorship, law clerks, the Solicitor General, federal policy, Red Power movement, and so on. Indeed, the arguments pertaining to the effect of Court decisions seem similarly ripe for study, and this book invites those extensions. Despite Ball’s nuanced tracing of ideological battles and transitions on the Court and invitation for future scholarship, the book experiences some limitations. First, Ball explains that the “silent” part of the “silent revolution” refers to the gradual nature of this (large-scale) transition as well as the Court’s “deliberation away from public scrutiny” (p. 6). However, Ball fails to address the second point on public scrutiny at all. Secondly, the case selection is unclear, particularly for the handful of cases since 2001 designed to “show that the trend of these changes continues to present day” (p. 3). Furthermore, some of the cases discussed had not been determined by the Supreme Court at the time of his writing, so the author is forced to speculate about the possible outcomes based upon his asserted “integrationist” trend. More importantly, while Ball briefly mentions several federal policies, the analysis of the Court remains largely in isolation from federal policy during the “silent revolution” and first half of the book. As such, it is difficult to ascertain whether the Court was indeed initiating the demise of the sovereignty doctrine, contrary to federal policy positions, as argued. The Court papers themselves supply no evidence that the Court or individual justices sought to contradict federal policy. In fact, they consistently made explicit calls to leave these issues to Congress and expressed the desire to keep their decision narrow to avoid sweeping decisions that would encroach upon legislative powers and policies. Hence, it remains unclear the degree to which the revolution itself was an intentionally “clever” strategy by the Court to erode indigenous sovereignty. Rather, at several points in the book, the revolution appears more like the product of a series of well-intentioned decisions that increasingly backed the Court into a corner due to inadvertently created constraints of inconsistent precedent, widely variable case facts, and fundamentally divergent legal theories of sovereignty. While it seems clear that the Court has increasingly favored one approach over another in terms of cases pertaining to non-Indians, the assertion that this trend is a clever manipulation intentionally orchestrated by the Court remains limited. The major point of ideological contention identified by Ball is the notion of whether tribal sovereignty powers over non-Indians exist until extinguished by Congress or exist only once delegated by Congress. Yet, this point of contention may not be with the purpose of redefining tribal powers; rather, the contention exists due to the differences in how one interprets the original Marshall trilogy. The Marshall trilogy consisted of the first three cases that determined indigenous claims and established the early relationship(s) with Indigenous Peoples. Specifically, the trilogy consists of JOHNSON V. M’INTOSH (1823), CHEROKEE NATION V. GEORGIA (1831), and WORCHESTER V. GEORGIA (1832). Ball focuses on WORCHESTER’S establishment of inherent tribal sovereignty as wards of the federal government as the historical (and thus correct) approach. Yet the “integrationist” approach is derived directly from CHEROKEE NATION’S establishment that tribes are not foreign nations but are “domestic dependent [*55] nations.” Indeed, even these initial three cases are not consistent in their establishment and interpretation of tribal sovereignty. The debate within the Court thus comes back down to which of these first cases one uses to define sovereignty. While WORCHESTER provides much stronger indigenous sovereignty rights compared to CHEROKEE NATION, precedent has used both interpretations without resolving the underlying inconsistencies. Hence Ball’s argument that the “integrationist” approach is legally incorrect may be limited. Sill, the effects on sovereignty are undebatable. In conclusion, this book presents a new perspective on judicial decision making in indigenous sovereignty cases in a manner that is clear and well-organized. The book is insightful and provides a variety of new ideas and questions for readers who will no doubt become invested in their answers. If a book is evaluated in terms of how many questions it makes the reader ask so as to solicit new discoveries and interest, then this book is among the best. OLIPHANT V. SUQAMISH INDIAN TRIBE, 435 U.S. 191 (1978). WORCCHESTER V. GEORGIA, 31 U.S. 515 (1832). © Copyright 2018 by author, Rebecca A. Reid.